Early this morning while I was in Delaware Park skiing, this big old salt truck came by beeping its horn and spewing salt in all directions. Then it passed me, drowning me in exhaust. If that is not a metaphor for how my New Year is going, I do not know what is! 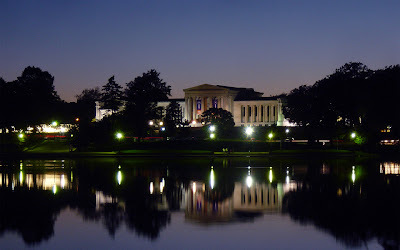 Note to out-of-towners: That is a corner of Delaware Park pictured above. Isn't it beautiful? I forget which Web site I ripped that picture off from. Well, it did not look like that this morning. Today the sky was gray and ominous. That also illustrates my entry into 2009. I am (choose a cliche)... behind the eight ball, going nowhere fast, taking on water, goin' down slow. I did not even get my New Year's Resolutions done and here it is January 2! Plus lastnight, late, the phone rang and it was Leonard Pennario's old girlfriend Diane again and we talked and talked. We are getting to be friends. She is a fascinating woman with a great Oklahoma twang in her voice. If there is one thing I love it is hashing over Pennario's love life so after that it took me a while to get to sleep. Check out that link: It is the Portland Symphony! 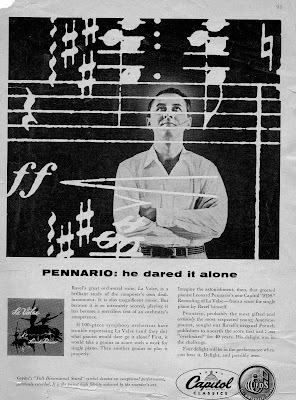 They are bragging on how Pennario played a concert with them on Dec. 7, 1943, and received a "tremendous reception." I should email them a picture of Pennario to put on their Web site. 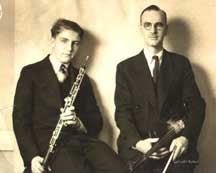 It would jazz it up than the picture they have of this oboist and his dad. I mean, look at these guys. And now look at Pennario. Back to Diane, Pennario's old flame. She is very helpful and happy to talk to me. But she told me right off when I called her the other day that four years ago she had a medical condition that required her to get these steroids, and they affected her memory for anything more than four years ago. Can you beat that? I am so thrilled to find this old girlfriend and then I find she has lost a lot of her memory. The good news, though, is that if you ask direct questions, she remembers things. You cannot ask, "What was Leonard like back then?" and expect her to come up with anything. But you can ask: "How did he ask you to marry him? Did he get down on one knee? What did he do?" That kind of thing. And she remembers. Like everyone who crossed Pennario's path over the years she is beautifully spoken. She told me I should talk to her sister. Her sister is 75 and has been helping jog her memory. But here is another situation that cracks me up. I have to call the sister soon, in the next couple of days, because she is leaving for Antarctica. "I don't know if her cell phone will pick up there," Diane told me. My head was spinning. The one sister got steroids that made her lose her memory, and the other sister is leaving for Antarctica! How about that? The sister is a travel agent and that is what she does. It is amazing, the thought of a 75-year-old who leads tours of Antarctica. Howard said: "You should write a book about her." OK, but first, I need to write my New Year's resolutions. I am sure everyone else has made theirs by now, and I do not like to be falling behind. I will post them later today without fail. Now I am going to go shake the salt off my clothes.